While visiting Silicon Valley, staying at a boutique hotel is a must. These stylish, luxe and hip hotels make for the perfect home away home. Silicon Valley is one of the world’s top technology capitals. Why not balance out all that innovation and tech with trendy accommodations at these boutique hotels. This architecturally gorgeous hotel is well-known for being one of San Jose’s remaining “Zigzag Moderne” Art Deco buildings. The exterior is as lovely as the interior; the rooms are open, the European-style Caffe La Pastaia on-site serves up delicious Italian cuisine in an elegant setting and the concierge service is remarkable. 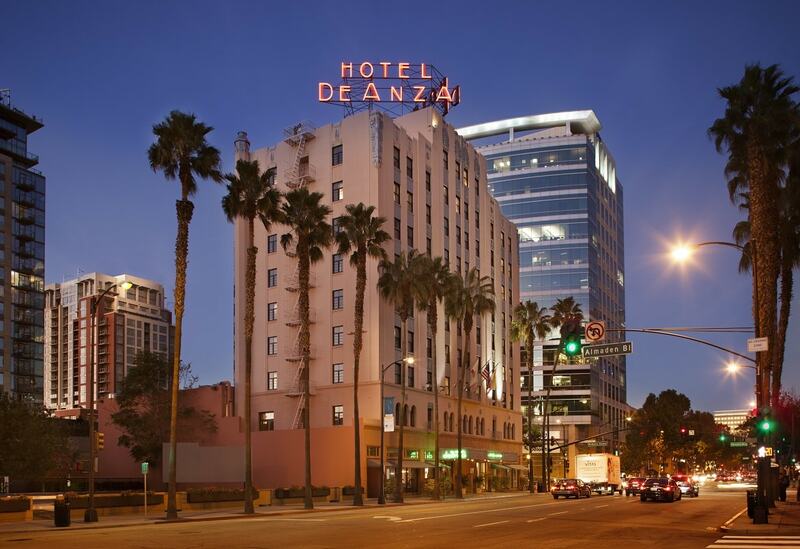 Hotel De Anza even boasts being a top choice of celebrities staying in the hotel like Eleanor Roosevelt, Wiz Khalifa, Jack Dempsey, to just name a few. Jazz lovers will also fall head over heels for Hotel De Anza, because its the home of some of the Bay Area’s best jazz nights (at the Hedley Club Lounge, also on-site). This chateau-style hotel will make you feel like you’re taking up residence in a French villa. The Enchanté Boutique Hotel is classic and contemporary, complete with marble floors and showers in the rooms. The amazing location, right by buzzing downtown Los Altos, is perfect for guests who’d like to go out on the town. While, at the same time, those looking to stay in can enjoy kicking back in the library, getting cozy by the fireplace or on the outdoor patio. These loft-inspired rooms will truly make you feel at home. Aloft Silicon Valley takes care of your every need; 24/7 options for hungry foodies on-site, keyless entry into your suite, live music performances at the hotel’s W XYZ Bar and so much more. But what really makes Aloft Silicon Valley special is BOTLR, the hotel’s robotic butler, there to bring you towels at the pool or bring extra toothpaste to you room or what have you. That’s some Silicon Valley hospitality in the tech capital! At the Garden Court Hotel, guests really feel as if they are staying in a place fit for royalty. The luxurious hospitality is world-class and something that everyone should experience at least once. The open rooms are flooded with natural light, the on-site restaurant is tasty and heavy on the ambiance and virtually all the hotel staff go above and beyond to make your stay unforgettable at the Garden Court Hotel. If you’re lucky you might get to catch a glimpse of one of the many weddings held on the grounds. Sit back and relax at The Domain Hotel in Sunnyvale. This boutique hotel is perfect for those looking for a home away from home with an twist of elegance. Whether guests decide to stay in a standard room or opt for one of the many luxe suite options, the rooms are spacious and part of the perfect getaway. All the beds inside The Domain Hotel are sleep number mattresses, ensuring a perfect night’s sleep. And once you feel rested, head to the on-site Bytes Cafe and Bar for an evening of fine dining. This boutique hotel is a part of the Curio Collection though the world-renowned Hilton, so you know you’re in for a treat at the Juniper Hotel. The decor has a Mediterranean-inspired flare with modern touches. Relax on the outdoor patio, have drinks with friends from the on-site Parkview Kitchen and Spirits or kick back in your room with sleek yet comfortable furnishings.